Recently, I’ve gotten back into curling. I thought my days as an athlete would end when Quidditch did, but here we are. Anyway, I had old curling shoes that still fit and the baseball gloves I wore for Quidditch also work for curling, so I was good in those departments. The only thing I needed was pants. Or, wanted, I should say. I have two identical pairs of yoga pants that I wore throughout university for Quidditch. They weren’t very flattering, in my opinion. They fit well above the knee but below that, they were loose and boxy. You could fit another calf in there, easy. But it was just Quidditch, and those pants regularly got dirty with mud and goose poop (I wish I was joking), so I didn’t care that much. But now that I’m curling again, I wanted better pants. So we hit up the mall. We had to go to six different stores because the market for women’s athletic pants is ridiculous. Here are the four options you can choose from. Yoga pants similar to what I had. Bootcut bottoms with no flair (because people wear boots with yoga pants? Ew). Only ever black. Do the makers not know that women’s hips are wider than their ankles? Unless I’m joining ABBA, I don’t need these in my life. It’s bad enough a lot of workplace pants for females are boxy, I don’t need fun pants to be this way too. Leggings as tight as a cobra’s grip. Do you think you can get your feet through these without needing to sit down and do some heavy breathing? Guess again. They come in different colours, and some even have breathable meshy patches. But unless you wear tights often, you’ll never quite be comfortable with the crotch. I dislike these because they’re too tight and constricting and never fit right and don’t even look that great and putting them on/taking them off is such a struggle. Feet should not be forced through that tiny, unstretchy opening. 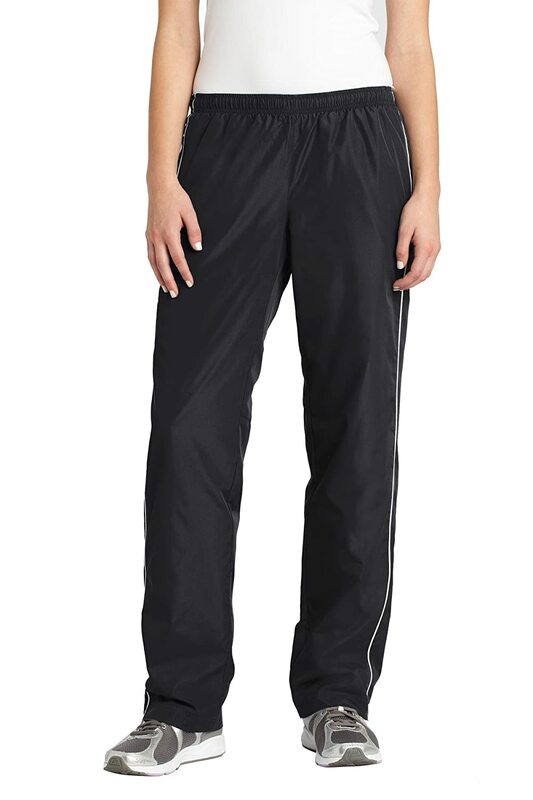 Windbreakers, which are like yoga pants but worse because they’re not even fitted at the top. I guess these may be good for jogging outside and repelling water, but they’re certainly not flattering. It’s like they’re covering up a better pair of pants underneath. Plus, you can just hear the whrush whrush these make just from looking at them. Not cool. Looser pants with a cuffed bottom, which is a style young men are wearing these days and I think it’s ridiculous because do you want baggy pants or not? Make up your mind. At least these come in a variety of materials and colours, and some aren’t too baggy. But these are dangerously close to having legging-sized feet holes. Boo. The thing is, I don’t HATE any of these, I just hate small aspects of all of them, and none of them are my style or suited my curling-specific needs. All I wanted was a pair of athletic pants in the style of jeans so they’re fitted but not a struggle to get on. Apparently, that was too much to ask. I ended up finding a pair of black pants similar to option 4 so they had a small cuffed ankle but weren’t hard to get my foot through. They were stretchier and looser than jeans but not baggy, which was good since curling involves some lunging and I needed to have that ease of movement. As an added bonus, they have pockets! It’s what I deserve after having to try on easily close to 30 pairs of pants. Anyway, the point of the story here is there should be more options for female athletic pants. Skin tight leggings and unflattering baggy pants shouldn’t really be the only options at most stores. How hard is it to just make soft, stretchy pants just slightly fitted? It’s absolutely ridiculous that I had to go to six different stores and see many, many pairs of leggings and yoga pants. A happy medium is all I ask. Or am I a weirdo for wanting this? So I like my workout pants high waisted and really tight. If I’m doing body squats or I’m doing burpees, I don’t want excess fabric to drag along with me. I guess it depends on what kind of movement you’re doing. I wouldn’t want huge drag either, but I know I personally would not enjoy doing burpees or squats in something as tight as leggings (not that I’d enjoy doing them at all) so I’d happily take a little drag if it means by thighs can breathe!